George Bickerstaff (1893-1954) was born in Marianna, AR, and died in Ukiah, CA. He also lived in San Diego, Los Angeles, Van Nuys and Texas. He was a prolific painter of mountain and desert scenes. 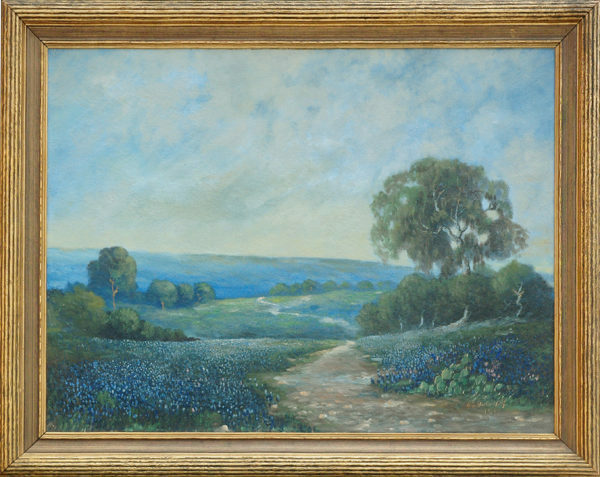 His landscapes often include eucalypti as well as rolling hills of California wildflowers such as Poppies and Lupines. Occasionally, he painted seascapes, still lifes, and western and Indian scenes. He studied at the Art Institute of Chicago. He exhibited at Van Nuys and with Paul Lauritz and sold many of his works to hotels, and other public venues. Comments This painting is in excellent condition in the original period frame, also inexcellent condition.